Scripture: Mark 6:6 And he was amazed at their lack of faith. Observation: I pray that Jesus from now on can’t say that about me. 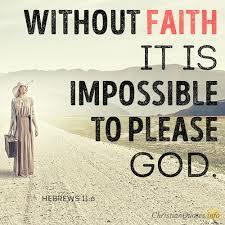 I realize I lack faith at times, but I don’t want to ever be in a place that it amazes God the lack of it. Application: To live knowing Jesus is always with me. That my faith is built on the power of my God who will never leave me or forsake me. Knowing whatever I do or wherever I am that I should be confident in my Lord. To continue to ask for my faith to be strengthened and to do everything I can do to trust God completely. Prayer: Dear Lord increase my faith and fill my heart with your love and give me the confidence to walk with you always.